Living near the Yellowstone National Park in the US, Lithuanian outdoors man, Darius Sasnauskas’s backyard was one place where he would see wild life reveling in nature. The best thing ever was to sight a mother deer giving birth to two beautiful little fawns. While shooting the mother and her two fawns in his camera, Darius found that one fawn had a leg injury and was left behind by her mother near the backyard. “With so many predators around, she had no chance to survive on her own,” said Darius. Darius wanted to protect the fawn and so he decided to bring it home to take care of her to send her back to her mother. Darius had many pets and so it was important that they all made the little fawn feel at home. Darius took good care of the baby fawn, fed it many times a day to make sure it gets better. “I do not support keeping wild animals as pets, but this was [a] special situation,” he wrote in his video’s description. He helped her get back on her feet with the help of an oatmeal box that he used as a brace for her. After the baby fawn got better, Darius released so that she returns to her mother but it kept coming back. However Darius, knew he would never be able to replace baby fawn’s real mother and so one fine day, the baby fawn reunited with her family. 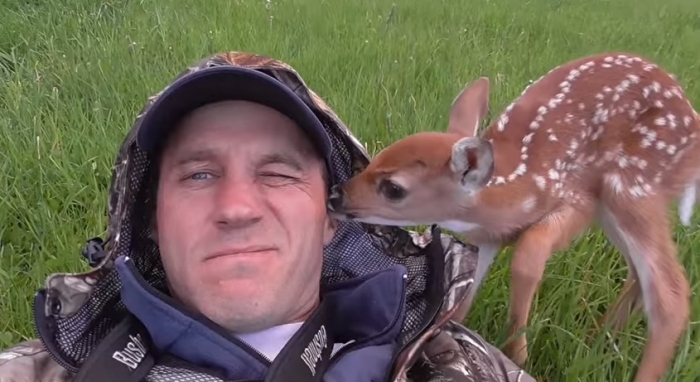 Here watch the beautiful story of Darius and the little fawn he rescued in the jungle. You can also read: Man reunites with gorilla he raised 5 years ago; what happens when they meet is beautiful!